First Thomas Stanley told you who America’s wealthy really are: The Millionaire Next Door. Now, in The Millionaire Mind he tells you how they got there, and how you, too, can become one of them. In this groundbreaking study of America’s wealthy, The Millionaire Mind targets a population of millionaires who have accumulated substantial wealth and live in ways that openly demonstrate their affluence. Exploring the ideas, beliefs, and behaviors that enabled these millionaires to build and maintain their fortunes, Dr. Stanley provides a fascinating look at who America’s financial elite are and how they got there. How did they respond to negative criticism? Thomas J. Stanley uncovers the surprising answers to these and similar questions, showing readers through concrete examples just what it is that makes the wealthy prosper when others would turn away dejected or beaten. 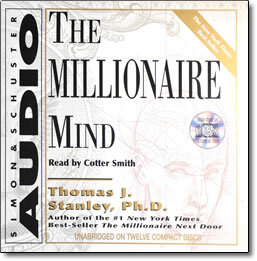 The Millionaire Mind provides transformational insights into the minds of the wealthy and answers universal questions with solid statistical evidence in an approachable, and anecdotal style.